One can hardly drive through any city or town in Massachusetts without encountering numerous blights on the landscape presented by abandoned commercial parcels, industrial parks, fenced off landfills and the like. These sites are categorically known as Brownfields, or properties that that contain hazardous substances pollutants or contaminants drastically complicating options for redevelopment or reuse of the land. In an age of increasing understanding of the vital role undeveloped land plays in the health of our citizens, habitats and the planet as a whole, these areas have become a blight on our collective consciousness. As the Massachusetts economy has shifted over the past several decades from an industry base to a technology and education base, many sites have been abandoned as Brownfields while developers simultaneously claim more and more of our untamed landscape. As interest in renewable energy gains momentum there is more demand for large parcels of land designated for energy production. Solar parks, wind farms and biomass collection sites may indeed hold the key to future energy production; however, each requires large parcels of land for implementation. Brownfields have recently emerged as ideal sites for such facilities as they have already been essentially written off as unusable spaces. In 1995 the United States Environmental Protection Agency launched a Brownfield Program designed to “change the way contaminated property is perceived addressed and managed.” This program has inspired, encouraged and facilitated the redevelopment of many of these properties. This paper will examine three efforts to reclaim Brownfield sites in Massachusetts presented at the Brownfields2006 conferences sponsored by the EPA and ICMA. The EPA estimates that there are 450,000 Brownfield sites in the United States. The agency further purports that cleaning up and reinvesting in these properties increases local tax bases, facilitates job growth, utilizes existing infrastructure, takes development pressures off of undeveloped land and both improves and protects the environment. Three success stories were outlined in a panel discussion entitled Solar, Wind and Waste: Renewable Energy on Brownfields; the conversion of the former Brockton Gas Light Company gas works site to a bright field; the implementation of the Greater New Bedford Landfill Gas Utilization project on the site of the Crapo Hill Landfill; and the construction of Hull Wind Turbine II on a cap-closed landfill. The former mayor of Brockton, Jack Yunits, tells a tale all too common in Massachusetts. Once a wealthy industrial town, the city of Brockton has seen most of its profitable industry shut its doors over the past forty years. As the population of the city has grown and development has reached 97%, residential areas have spread to directly abut industrial areas. Contaminants leached into the soil decades ago by a gas manufacturing plant remained below the surface and were beginning to migrate. It became clear that leaving this site abandoned could pose health risks to nearby residents and contaminate the water table. In conjunction with the EPA, the Bay State Gas Company remediated the property by capping contaminants below the surface. While most construction and development projects would risk permeating the cap, the city of Brockton sought a lease of the land for the construction of a solar brightfield. Under the leadership of Lori Ribeiro, the Brockton Brightfield Project took shape. Although the installation of the 1395 SCHOTT Solar modules took only two months to complete, six years of planning was required to get the project going. Extensive feasibility studies determined that of the twenty-seven acres of land, only ten were developable. The $3.037 million construction costs were funded by the city of Brockton, state and federal grants. A revenue neutral facility, the site supports its own operating costs through the sale of electricity and Renewable Energy Certificates. A green perimeter has created green space for the community to enjoy where an industrial wasteland once stood. The site is anticipated to produce 535 Megawatt hours of clean electricity; resulting in a 589,570 lbs. reduction in carbon dioxide emissions. This site serves as a model for cities and towns all over the state and nation that the ecological damages of the past can be countered by the investments of the future. George Aronson, a private investor from CommonWealth Resource Management spearheaded the privately funded project to capture methane from the municipal solid waste facility, Crapo Hill Landfill in Dartmouth, MA for electricity production. The Crapo Hill Landfill is a capped landfill. Landfill gas is a natural byproduct of the anaerobic decomposition of organic materials deposited over time in a landfill. Comprised predominantly of methane and carbon dioxide, landfill gas can provide about one half the heating value of natural gas. Left uncollected, these gases vent into the atmosphere contributing to global warming. By harnessing landfill gas, there is a twofold reduction in climate altering emissions; energy produced reduces the demand for carbon emitting energy production, while reducing the direct emissions from the landfill. Pumps and pipes draw gas out using 60 psi vacuums where it is used to fuel four reciprocating internal combustion engine-generator sets that produce electricity. The electricity generated at this facility is exported to the regional power grid via an interconnection with the local electric power distribution utility. It is anticipated that the site will produce 26 million kWh of electric power output for sale annually. Interestingly, CommonWealth Resource Management has begun to use the LFG site as a unique opportunity for individuals to contribute to emission reductions. 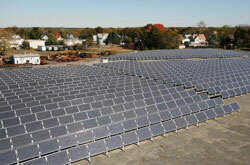 Renewable Energy Credits are often sources of income for such sites. Awarded to facilities that provide renewable energy, they can be sold wholesale to industries that are exceeding their emissions quotas in an effort to limit emission growth. CommonWealth has decided to make these RECs available for sale at the retail level. Individuals that choose to purchase credits through their subsidiary e-BlueHorizons LLC are able to take credits off the market and ensure that they will never be used to justify emission production. 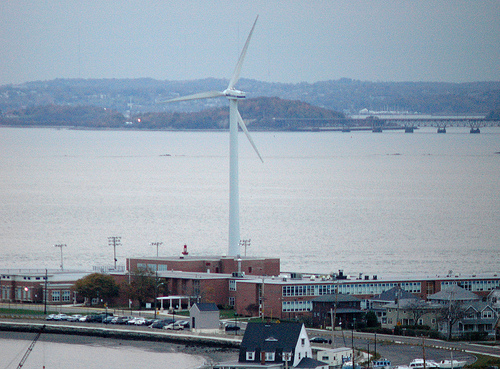 Another cap-closed landfill in Hull, MA has proved to be an ideal location for the second wind turbine in the Hull Wind project begun in 1997. Andrew Stern of the Citizens Advocates for Renewable Energy explains the success of a community based organization driving Brownfield revitalization. The turbine sits atop a 20 meter landfill, supported by 30 foot pilings that sink just above the membrane capping the landfill. It is anticipated that this turbine alone with produce 4,500 MW per year. Since it went online in May of 2006, it has already produced over 18,000 MW. Combined with the first turbine installed in 2001, wind will supply 13% of Hull’s electrical load. Plans for four additional offshore turbines are expected to cover 100% of the load on average. 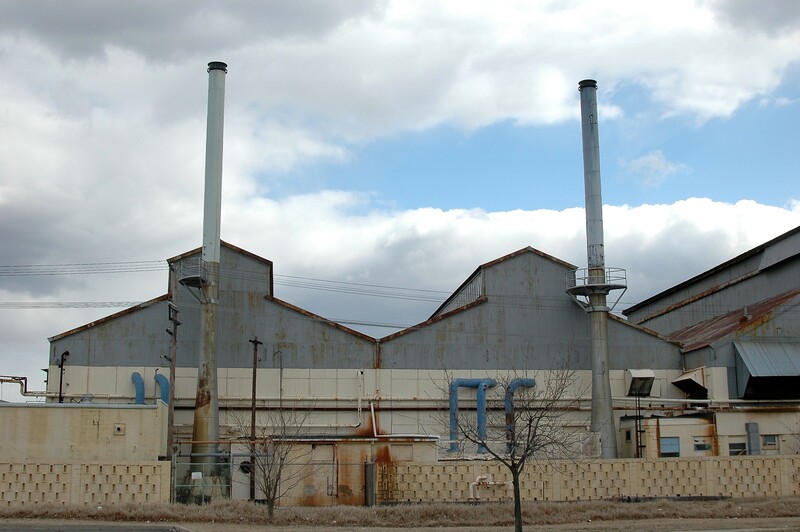 The innovative revitalization of each of these Brownfield sites has provided hope for environmentally and economically downtrodden communities. The desolation of abandoned mines, landfills and industrial parks has for too long epitomized the standard of living of many communities. While we may never be able to restore these sites to their original pristine levels, they can be controlled through subterranean capping membranes and reused to revitalize neighborhoods. In each of the examples sited above, this is achieved while contributing to the renewable energy revolution. The communities surrounding each of these sites have experienced increases in property values and supported many local jobs. Those of us immersed in the field of environmental studies are constantly faced with bleak statistics. It seems that the more we learn about ecosystems, the atmosphere and climate patterns, we find ourselves further and further down an irreversible path. While neither the damage our energy production has done to the atmosphere nor the damage our industries have done to our land can be reversed, the examples sited above prove that we can indeed change our trajectory and begin to correct some of the damage that we have done. Indeed there is hope in desolation.